This cake looks deceptively simple but the photo says everything: golden brown on the outside, crunchy sugar topping and moist and fruity on the inside. Definitely a treat for afternoon tea on a windy autumn afternoon. With a lovely old vintage tea set, of course. The recipe comes from Mushroom Lane, a quirky ‘fabric, fibre, food & flower’ blog written by Flower, a mother of five who finds time to showcase ‘vintage inspired goodness’ and other wonderful things. She calls it a proper mental feijoa cake which I think I can translate from Kiwi into really awesome. Beat butter and sugar until creamy. Add egg and golden syrup and beat well. Mix baking soda in water and stir into the mixture. Add flour, baking powder, orange rind and feijoa pulp and mix lightly. Pour into a greased tin and bake at 160°C for 45 min. Remove from the oven and top with the mixture of brown sugar (try raw or demerara sugar if you prefer) dissolved in the orange juice. Serve warm with cream or cold as you would a cake. I have come across this recipe multiple times in food forums and cooking blogs and its popularity suggests that it is a goodie. Annabelle White is a popular TV and radio cook in New Zealand. She has published eight cookbooks and appears regularly on TVNZ’s Breakfast show. This recipe comes from the TVNZ website where you can find more of her recipes. Line the base of a 9″ (22cm) cake tin with baking paper and anti-stick spray the paper plus the sides. Cream together the butter and sugar very well. Beat in eggs one at a time until well combined, then lastly the essence. Sift dry ingredients over mixture and add at the same time the sour cream and almond meal. Spoon into prepared pan and very lightly press in the cut fruit (cut side up). The fruit should be quite crowded but in a single layer. Sprinkle Demerara sugar/ginger evenly over fruit and put cake into oven and immediately set temperature to a reduced 180°C. Bake for 50 minutes, turn oven off and leave in oven for an hour. You can use other stoned fruit (plums, peaches, apricots) instead of feijoa and if using fresh figs change the almond essence and use rose water instead. If making it an apple cake – add cinnamon to the Demerara sugar. Freezes well. Cut into portions before freezing. Serve with a “side” of some of the same fruit – poached – and a dollop of either whipped cream or yoghurt. Feijoa and Baileys…. how can you go wrong with that combination. The original recipe for this cake comes from a blog called Ecological Mum. Definitely one for me to try out when the feijoas are gathered. Fold in feijoas and white chocolate melts until just combined. Pour into a 23cm ring tin. Bake at 180°C degrees for approx 40 minutes. 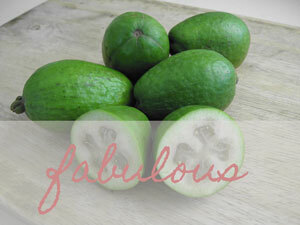 The humble feijoa climbed to new heights of culinary fame recently, featuring on MasterChef Australia. The complete dessert masterpiece, Manuka Honey & Feijoa Cake with Yoghurt Panna Cotta, Lemon Verbena Jelly, Jasmine-Honey Pudding, Candied Bread and Honey & Orange Blossom Ice-cream, by Chef Martin Bosley, can be found on the MasterChef Australia website and has a warning ‘Adult supervision required’. The little cakes created in separate ramekins look heavenly amidst the divine accompaniments, but I am only including the cake recipe here. Do try to find manuka honey, which is made by bees feeding on the sweet little flowers of New Zealand’s native tea tree or Leptospermum scoparium. While it is famous for its medicinal properties (and you do pay more for the kinds with the medical grade certification), you can also buy manuka honey that is a lesser grade (and cheaper) but which still has that wonderful unique flavour. Liberally butter 4-6 x 6cm individual oven-proof ½ cup ramekins. Line with a small cartouche of baking paper and add 2 teaspoons of honey to each one. Place on a tray and warm in the oven for 3 minutes to loosen the honey. Slice the feijoas in half across the equator and using a teaspoon, remove the flesh from the skin in one piece. Place one piece of feijoa into each ramekin onto the honey. In an electric mixer, cream butter and sugar until soft and fluffy. Beat in rum, honey and vanilla seeds, adding eggs one at a time. Combine flour, baking powder, ground almonds and salt and fold into butter mixture. Drop spoonfuls over the feijoas as carefully as possible, taking care not to dislodge them. Smooth tops and bake at 160˚C for 45 minutes until the cakes are golden and cooked, they should still be quite succulent. Start checking after 30 minutes. Allow cakes to cool in the ramekins for about 30 minutes and invert to serve. Check that all the fruit has been dislodged and serve warm. 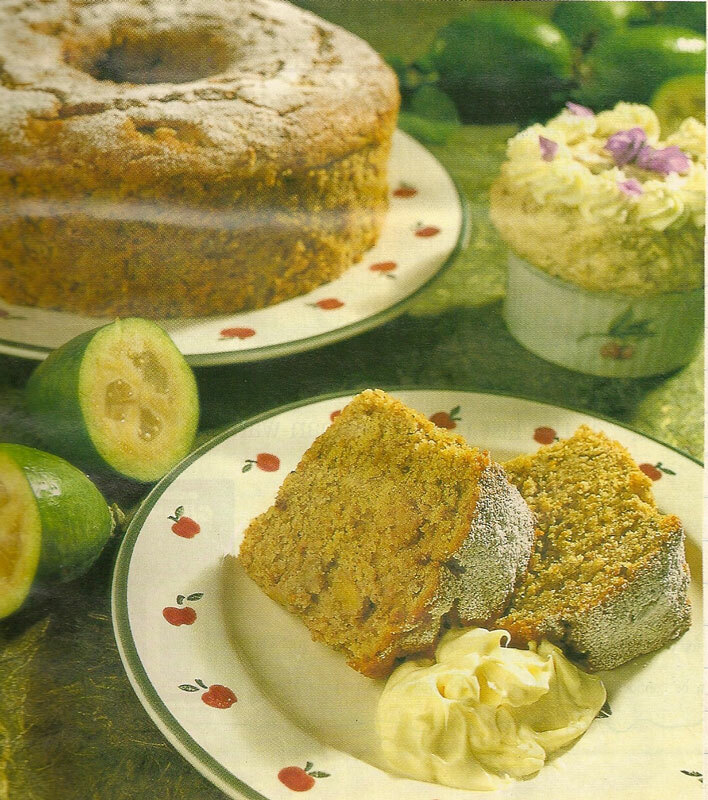 This is another recipe from the Television New Zealand archives, and featured in Astar’s 2008 special segment on feijoas. Update: Click over to Easy Food Hacks to see how to make this cake. After looking at the photographs there, this cake has jumped up my list of what to make this season. Sieve flour and wholemeal flour along with salt, baking powder and soda – add the wholemeal flour’s bran back. Serve with thick Greek yoghurt mixed through with freshly pulped feijoas. *Olivano or Olivani is a margarine-type spread made from olive oil that is available in New Zealand. I only ever use butter for baking so I am not quite sure what can be substituted here if you aren’t in New Zealand and can’t get hold of Olivani. This recipe comes from my mother’s old recipe book, a collection of hand-written recipes and clippings from magazines. There is nothing to indicate which magazine it has come from and if anyone recognises it, please let me know. Preheat oven to 180C. Grease a 20cm round ring tin; line base with baking paper. Beat together butter and sugar until light and creamy. Add eggs, one at a time, beating well after each addition. Beat in vanilla essence. Stir feijoas into creamed mixture. In a mixing bowl, combine flours, baking powder and spices. Stir baking soda into warm milk. Fold dry ingredients and milk alternately into creamed mixture. Spoon mixture into prepared tin. Bake for 45 minutes or until cake springs back when lightly pressed. Remove cake from oven and let it stand for 10 minutes before turning onto a wire rack to cool. To serve, sprinkle cake with icing sugar. Cut into wedges and accompany with cream.